We often throw bread from the jetty, which attracts a variety of seabirds including common, herring and black-headed gulls as well as our resident terns (we didn’t think the terns would readily take bread but presumably at this time of year, it’s needs must..). The black-headed gull in the picture is always first on the scene as he has taken to roosting on the grassy ledge in front of Lynn’s studio. 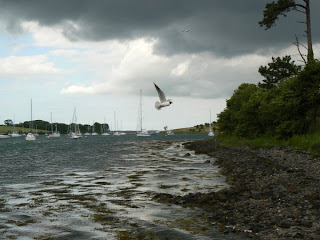 We assumed he came and went on a daily basis and that he roosted with most of Strangford Lough’s gulls on one of the smaller islands, but several times lately, en route to the (outside) bathroom in the early hours, I have seen him moving about on the foreshore. The other thing I’ve noticed is that the heron fishes at night – I didn’t know they did that. Given the amount of time he spends fishing by the jetty in daylight hours, he must surely be kipping on the job.